While cooking, one of the joys I experience is being under the constant surveillance of 4 hungry animals. My dog pack crowds joyfully yet aggressively around my feet as I chop, mix, stir, and cook. This makes my kitchen a hazardous and noisy place, but I wouldn't want it any other way. In order to please my demanding audience, I decided to bake up some gourmet doggy treats. I will share my recipes every few months as I try different things, and I know my pups will appreciate the special attention too. My first recipe is a parmesan and mint bone. The mixture may sound odd, but it smelled delicious while baking. My dog pack loved the end result, and the small amount of mint is great for freshening stinky dog breath. 1. Combine all ingredients in a large bowl and mix until well blended (mixture should be smooth). 2. 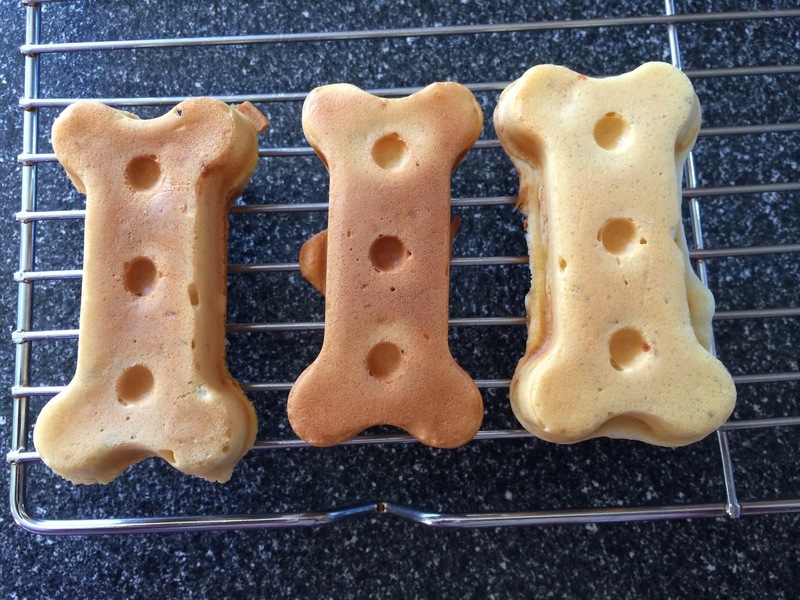 Pour the batter into a dog treat maker (see below) or into an electric waffle iron. 3. Cook batter for about 3 to 4 minutes until golden. 5. Remove bones carefully from the treat maker and place them on a cooling rack. Cook another batch until all of the batter is used. 6. Preheat oven to 300 degrees and then turn it off when it reaches that heat. Place the dog treats on a large baking sheet and place in the heated oven. Cook the bones in the oven for about 20 minutes. This will dry the bones out and make them easier to store. Be sure to turn the oven off during this step as not to burn the treats. 7. Cool the treats for at least a half hour and serve to fido as deserved.